In a few days time crowds of people will gather in cities, towns and villages up and down the country to conduct the least political celebration of the least politicised armed forces in the world. All the recent bluster about certain politicians, public figures and celebrities choosing to wear the white poppy of pacifism instead of the traditional red spectacularly misses the point of the entire event. The red poppy is a show of respect for the British soldiers, sailors, airmen and marines who are sometimes asked to make great sacrifices for their country. Absent of politics and the justness of the wars they must fight the Sunday, and the poppy, are about remembering the dead and helping the wounded. There is no base militarism in that sentiment, no crass jingoism. The white poppy today is often a symbol of moral indulgence, worn by those who do not understand the words or are taken to believe the worst of their fellow man. This is because ultimately the poppy and the remembrance ceremony are not about us, our problems and debates on the morality of war. 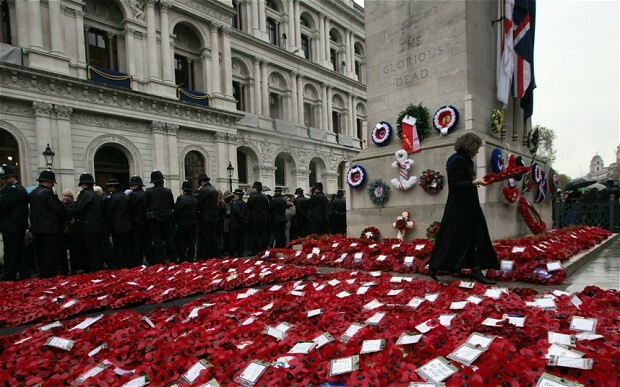 It is about them, those that we asked so much of, and those who we far too often forget. I'll leave you, dear reader, with excerpts from a pair of poems I find especially poignant at this time of year; and the message that at the going down of the sun, and in the morning. We will remember them. the old man did implore. How will you make a change? What is the greater plan? said the wise man in reply.